South Korea and the United States’ defense chiefs on Saturday pledged they would never tolerate a nuclear-armed North Korea, warning that any provocations would be met with “massive and overwhelming” retaliation. 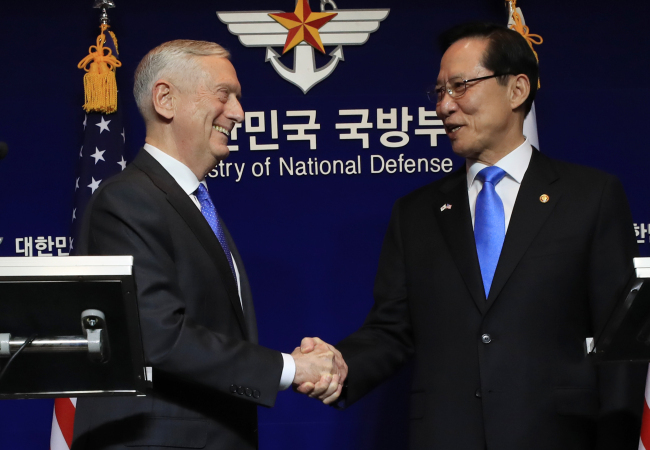 During their annual Security Consultative Meeting in Seoul, Defense Minister Song Young-moo and his US counterpart Jim Mattis reiterated their commitment to a diplomatic approach to the North, but stressed military options were on the table and they will carry weight in finding a diplomatic solution. In a bid to boost the allies’ deterrence and military capability, the allies’ defense chiefs agreed to promptly transfer wartime operational control to South Korea and expand rotational deployments of US strategic assets near the Korean Peninsula. But they remained pessimistic about bringing back tactical nukes here. “Make no mistake -- any attack on the United States, or our allies, will be defeated. And any use of nuclear weapons by the North will be met with a massive military response that is both effective and overwhelming,” said Mattis during the press conference at the Ministry of National Defense in Seoul. A day earlier, the allies’ chief visit to the heavily-fortified demilitarized zone that divides between the two Koreas, where Mattis said the US was not seeking a “war” with North Korea, but a “complete, verifiable and irreversible denuclearization” of the regime. According to the joint statement, Mattis reaffirmed the US commitment to providing extended deterrence for South Korea using the full range of military capabilities, including nuclear umbrella, conventional strikes and missile defense capabilities. Among them are rotational deployment of US strategic assets, such as its aircraft carrier strike group, nuclear-powered submarines and stealth bombers. Most recently, the US has dispatched the USS Ronald Reagan and B-1B supersonic bombers on the peninsula as a show of force against the North. “In order to enhance the US’ extended deterrence commitment, we agreed to expand rotational deployment of US strategic assets and vowed to increase cooperation on deterrence policy,” said Song during the press conference. Song added that the allies agreed to come up with new missile guidelines following the agreement in September to scrap limits on South Korean missile payloads. Previously, Seoul was banned from fitting warheads of more than 500 kilograms to a missile with a range of over 800 kilometers. In order to better respond the North’s ever-growing asymmetric capabilities, the allies’ militaries also vowed to push to improve South Korea’s access to the acquisition of highly advanced US military assets. Regarding the transfer of wartime operational control, the allies agreed to complete the process promptly and submit a detailed plan by next year. But the complete transfer would depend upon “conditions” — including whether Seoul secures enhanced military capability to respond to the North. “We did not mean to move up the timeline in a hurry, but create conditions for the transfer as quickly as possible and take back operational control in time. Even when we take back operational control, our alliance will remain rock solid,” said Song. When asked about the idea of returning US tactical nuclear weapons to South Korea, the allies’ defense chiefs said US extended deterrence was sufficient in addressing North Korea’s nuclear and missile threat. “When considering national interest, it’s much better not to deploy them,” said Song, adding that the allies would have “sufficient means” to respond to a North Korean nuclear attack even without placing the weapons in the South. Mattis agreed, saying current US strategic assets on the peninsula and in the region already provided nuclear deterrence. South Korea never brought up the subject of tactical nukes during the talks, he added.